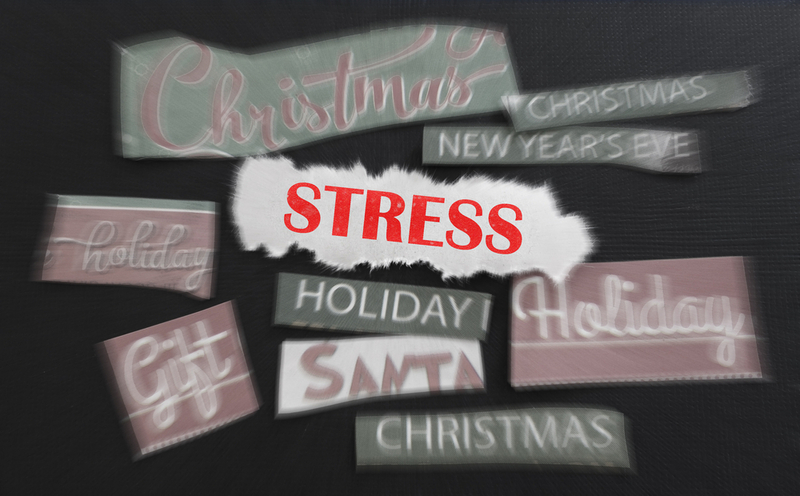 » Eliminate ‘Christmas Stress’ by controlling your cortisol levels. When we think of the festive season we all have an ideal of what Christmas should be all about. This being, having fun with friends and family with great food, company and seasonal cheer that leaves you feeling relaxed and happy and ready to start the New Year afresh. However, for many people the reality is a stressful build up, overindulgence on the big day and post festive bloat that leaves us limping in to the New Year with a bunch of impossibly unobtainable resolutions and a feeling of relief that it’s all over! Whilst, I can’t promise you a winter wonderland I can help to make sure that this year your Christmas is closer to the ideal. The secret to achieving this is through awareness and control of a steroid hormone called cortisol that we all produce and which can become severely unbalanced at this time of year and is a major factor in ‘Christmas stress’. Cortisol, a glucocorticoid (steroid hormone), is produced from cholesterol in the two adrenal glands located on top of each kidney. It is normally released in response to events and circumstances such as waking up in the morning, exercising, and acute stress (which for some of us Christmas time!). As with all hormones, there is a delicate balance of where you want your cortisol levels to be. When hormones are unbalanced they can have a massive affect on your health, your weight and the way that your body functions and copes at potentially stressful times of year such as Christmas. Repeated elevation of cortisol will cause weight gain especially around the abdominal region as well as constricting the blood vessels which will increases blood pressure. In the long term high blood pressure can cause vessel damage and plaque buildup that can eventually lead to a heart attack. You’re not sleeping well – Cortisol levels are supposed to drop at night time, allowing your body to relax and recharge. But if your cortisol levels are too high, you might notice that, even if you’ve been tired all day, you can’t get to sleep at night and often wake frequently through the night too. You’re gaining weight, especially around your abdomen – Cortisol tends to make you thick around the middle. You catch colds and other infections easily – Cortisol deactivates your body’s natural self-repair mechanisms, which means that your immune system which is perfectly designed by nature to keep you healthy begins to slow down leaving you more vulnerable to picking up infections. You crave unhealthy foods – Cortisol raises your blood sugar, putting you at risk of diabetes. High glucose levels then bump up your insulin levels, which then drop your blood sugar that makes you crave unhealthy foods. You’re experiencing frequent backaches and headaches – When your cortisol levels are high over a long period of time, your adrenal glands start to get depleted. This raises prolactin levels, increasing the body’s sensitivity to pain, such as backaches and muscle aches. Excessive cortisol also hyper-sensitises the brain to pain, so even the slightest twinge can excite the nerves of the brain, causing headaches. Loss of libido – if cortisol levels are low libido-inducing hormones like testosterone drop. Tummy problems – Your gastrointestinal system is very sensitive to stress hormones like cortisol. You might experience nausea, heartburn, abdominal cramps, diarrhoea, or constipation as a result of too many stress hormones. Feel Depressed – High levels of cortisol suppress production of serotonin, which can lead to mood swings and depression. As you can see, cortisol can be responsible for a whole range of unpleasant symptoms, many of which are exacerbated at this time of year. The good news is that by following some simple guidelines that I’ve outlined below it’s easy to help your body to keep cortisol levels in check. In turn, your system will hopefully reward you with the most stress-free and perfect Christmas 2016! 1.Make a concerted effort to eat as clean as you can. You’ll be surprised at what a massive impact this can have on lowering cortisol, particularly paying special attention to limiting your alcohol and caffeine intake. Obviously, Christmas is a time when we enjoy rich food and the odd tipple but try to approach this in a balanced way by not using it as an excuse to go overboard for weeks on end. 2.Regular exercise. This doesn’t have to be high intensity. In fact, sometimes if your cortisol levels are high hard intensity exercise will actually stress the body further. Winter walks are a great way to keep active without stressing your system. Get plenty of fresh air, go for a walk with friends or a bike ride with the kids. Also your body will benefit and thank you if you keep mobile and have a good stretch if you need some ideas for some quick stretches that you can do at home click on this link. 3.Ask friends and family to give gifts that are kind to your body. Put a personal training session, facial or relaxing massage on your Christmas wish list. Particularly if you’re somebody who rarely finds the time to pamper yourself, Christmas can be a great excuse to make this a priority. 4.Spend time with family and friends that make you laugh and are good company. Be selective in the company that you keep and make sure that your leisure time is spent with people that make you feel good. Christmas shouldn’t be all about ‘duty’ or ‘all about the children’. Taking time to consider yourself (as well as others!) is essential to wellbeing.